Free money! 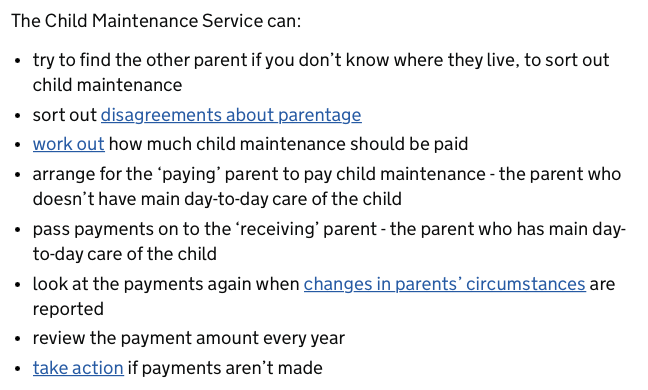 Yes, literally and yes, really… I have been using KidStart when I buy things on the internet – M&S, Amazon, Sainsburys, Expedia, Mothercare, Boden, Disney, Boots, Wickes, Debenhams, for tickets, furniture, clothes, hotels, trips, gifts, shopping, clothing, comparision sites etc etc etc. So long as I click through to the site via KidStart then they pay me a percentage straight into a bank account for one of the boys. Panic On The Streets Of London! 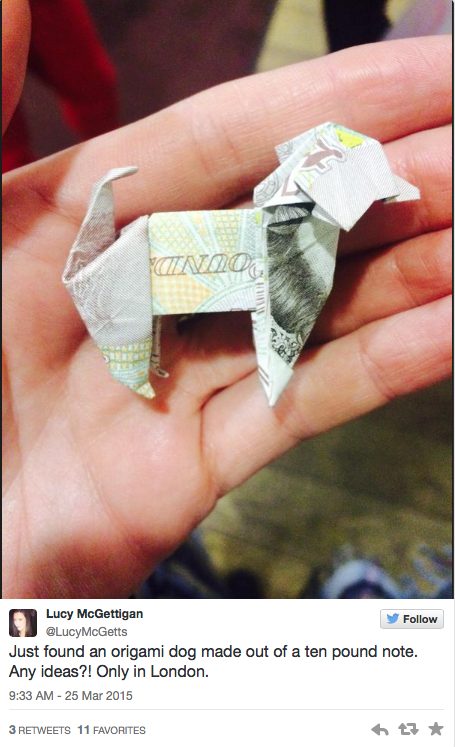 Well, £10 Notes Shaped Into Dogs Anyway. In an amazing feat of generosity and sensational marketing, @BeagleStreet have released the hounds with their #ReleaseThePounds publicity stunt. 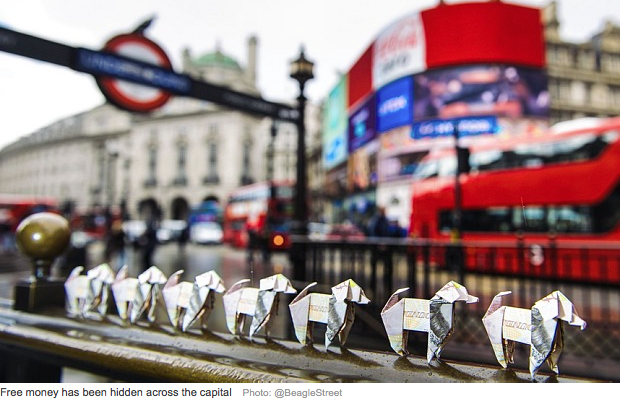 What more reason could you need to visit London this Easter? According to the Telegraph: A total of 500 tenners have been released in different locations across London as part of a stunt by online life insurance provider Beagle Street. “Hopefully our £10 note Beagles will put a smile on people’s faces and pounds back into their pockets,” said Matthew Gledhill, the company’s managing director. 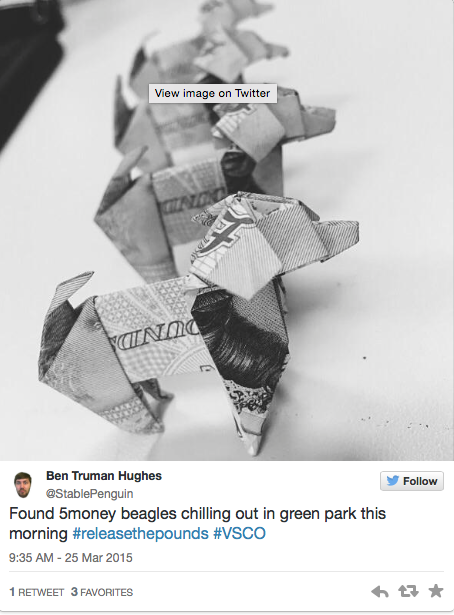 More of the £10 note origami canines will be released in other cities around the UK in the next few weeks. Let’s hope they don’t all blow away. People have already started finding them and sharing the news, will you be next? SpaceBunker is the brainchild of my son who is 15 and attends school in Cambridgeshire. He has always had a passion for understanding the universe, even from a very young age (approx 5) I’ve had to try to explain things to him like why there is a straight line on the moon when it’s a half-moon and why the sky is blue. Fortunately for me his love of the universe has progressed far beyond my rudimentary knowledge and he is constantly seeking new information and questioning the world around him. This project is currently more about sharing the knowledge that he already has via a dedicated blog and YouTube channel that can bring new and interesting facts about space, science, maths and general geekiness to the mainstream. It would, I imagine, be popular with a variety of age ranges and abilities and would have educational value. A bit about my son – other than the above, he is a very bright mathematician and has been studying an accelerated maths course and is a member of the school maths team. He has recently discovered that he has Synesthesia. He plays badminton, enjoys drumming and is currently partaking in the Duke of Edinburgh scheme. The KickStarter is currently 20% funded and he needs help reaching more people to make it work. Please consider backing the project, even if you can only afford a £1, because it will be so good for him to feel supported and also every little £1 will add up and between us we can reach the target! Click here to take a look and back the project. Please share this with your friends and colleagues and anyone you think might be interested. I’m quite fascinated with the emergence of Peer-to-Peer lending. Excuse my ignorance if I am wrong but isn’t this essentially how banking started out in the first place? Ok, I’ll admit I got that information from Deadwood, but moving swiftly on the overall premiss as I understand it is that instead of saving your pennies at your local bank or building society, you invest it in one of the (currently) three companies Zopa, Rate Setter and Funding Circle offering peer-to-peer lending and they then loan it out in very small increments in order to offset your risk. So if you invest say £5000 they might spread that across 500 different loans to protect your investment as much as possible and the interest rate is higher than you can currently get from the banks. Plus, at the moment, you even get to choose what rates you would like to set! Here is the BBC’s take on it. Personally, while I do think it is a lovely idea, I wouldn’t want to take the risk as the investments are not regulated and the investments are all made at your own risk. Therefore there are no guarantees that you would be able to get your money back! I do think that a lot of people will make a lot of money from this but I also think that at some point (possibly as less scrupulous companies get involved) it will go horribly wrong and people will lose their investments. What do you think? Would you invest in one? As January draws to a close, I keep hearing people say that they are struggling financially. For some it is the age old problem of over spending at Christmas, for others it is simply because they are finding it hard to make ends meet. I’ve had lots of experience of budgeting for various reasons and want to share with you a series of posts (all tagged #MoneyMonday) which I hope may help you regain control of your finances. So what qualifies me to give advice on this subject? I wont go back over the details on this post regarding the circumstances, they’ve already been posted here. As you can see, even with just the debts that I can remember, I was left with £36,016.49 of debt outstanding which cost me £20,082.61 to pay off. I’m pretty sure the total amount I spent paying off debts was closer to £28K so there must be a few that I’ve missed. It took me 6 years – the last debt was cleared in February 2010. My ex took one debt, an Abbey National current account overdraft of around £700. This was in joint names but he made me sign the account over to him so that he still had a bank account – this, of course, left me without one and with a completely ruined credit rating which meant that I couldn’t get one. For several years I had to use a building society passbook account and had no cards of any kind. Now you can get bank accounts specifically designed for people with bad credit that help you build your credit rating back up. 1. Don’t ignore your debts. They truly don’t go away they just get bigger and more unmanageable. 2. Get a copy of your credit file – this is a huge step towards taking control, yes it will probably tell you things that you don’t want to know, but do you know what? The debts are there whether you acknowledge them or not! You can get one month’s free trial from Experian. 3. Take control. Get an A4 ring folder and some dividers and make a file for each debt, then make an appointment to see a debt adviser. A FREE one like the CCCS. DO NOT PAY ANYONE TO ‘SORT OUT’ YOUR DEBTS! Either phone them or write to them asap. Tell them you are experiencing financial difficulties. Tell them your income and your outgoings – make sure you include everything that you have to pay out for. They will help you. 4. Dealing with people chasing debt. 5. Debt ‘selling’ – it may looks as though different companies are chasing you for the same debt; that’s because they are! 6. If you have some money to repay a debt, always offer a reduced settlement figure – 99% of the time they will either accept it or negotiate.